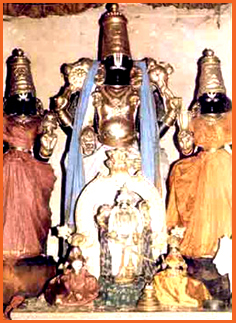 The Moolavar is Kaalamega Perumal seen in standing posture - right hand - varada hastam, gadai (mace) in left hand facing east. 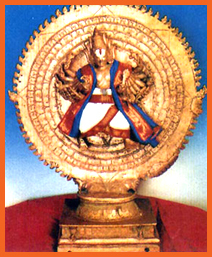 The utsavar is Thirumogur Aapthan with pancha ayudham (five weapons). There is a sannadhi for Palli Konda Perumal. There is a gold kavasam for Aadiseshan. Thaayaar - Mogurvalli (Mohanavalli, Megavalli). Access to the temple Seven miles east of Madurai. This divyadesam is found in Madurai district, 8 Kms from Madurai. There is no lot of bus and lodging facilities. We have to get down in Thirumoghur while travelling from Madurai to Melur.